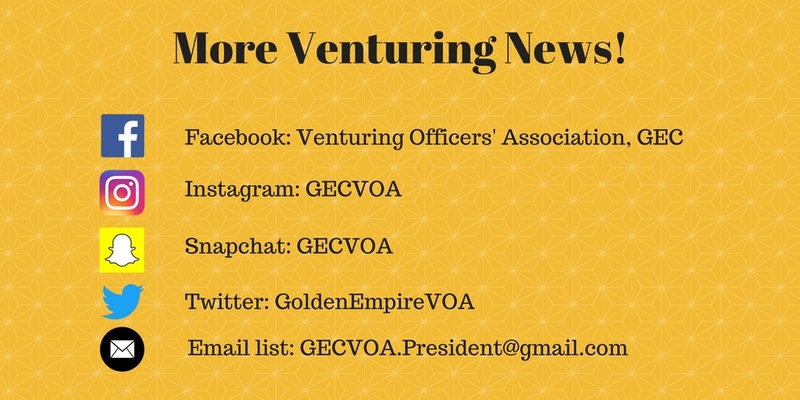 To be added to the GEC Venturing communication e-list, please click here. Venturing is based on a unique and dynamic relationship between youth, adult leaders, and organizations in their communities. The result is a program of exciting and meaningful activities that helps youth pursue their special interests, grow, develop leadership skills, and become good citizens. Venturing crews can specialize in a variety of avocation or hobby interests. Find a crew near you here! Please email your VOA officers with any questions, comments, or concerns you may have. We are here to strengthen and support the Venturing program in the Council and would love to hear from you!